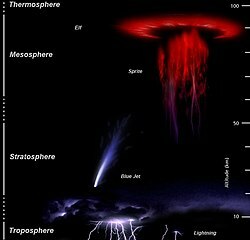 Atmosphere-Space Interactions Monitor (ASIM) is a project led by the European Space Agency that will place cameras and X-ray/γ-ray detectors on the International Space Station, where it will observe the upper atmosphere to study sprites, jets and elves and terrestrial gamma-ray flashes in connection with thunderstorms. It is hoped that measurements of these phenomena from space will contribute to the understanding of Earth's upper atmosphere. The ASIM components, originally planned to be completed in 2014, were launched on 2 April 2018 and mounted on the Columbus External Payload Facility on 13 April 2018. Danish tech company Terma A/S is running the technical part of the project for ESA and DTU Space (National Space Institute) from the Technical University of Denmark provides the scientific leadership of the project. Mission operations will be performed by the Belgian User Support and Operations Centre (B.USOC) in Uccle, Belgium. The Columbus External Payload Adapter (CEPA) and Data Handling and Power Unit (DHPU) form the structural and electrical connections, respectively, to the Columbus module. The Modular X and Gamma Ray Instrument (MXGS) is a pair of terrestrial gamma-ray flash (TGF) detectors. The low-energy detector is sensitive from 15 keV to 400 keV, and the high-energy detector is sensitive from 200 keV to 40 MeV. The Modular Multi-Imaging Assembly (MMIA) is an optical imaging system capable of observing 12 frames per second continuously in the 777.4 nm and 337 nm bands at 5 nm wide intervals. ^ "ISS Utilization: ASIM (Atmosphere-Space Interactions Monitor)". eoPortal. European Space Agency. Retrieved 8 April 2018. ^ Neubert, T.; et al. (2006). The Atmosphere-Space Interactions Monitor (ASIM) for the International Space Station (PDF). International Living With a Star Workshop. 19-24 February 2006. Goa, India. Bibcode:2006ilws.conf..448N. ^ a b Halton, Mary (7 April 2018). "Hunting mystery giant lightning from space". BBC News. Retrieved 7 April 2018. ^ "Terma to Head ASIM Observatory for ISS". Space Travel. 27 August 2010. Retrieved 7 April 2018. ^ "Largest Space Project for Terma". Terma A/S. 26 September 2016. Retrieved 7 April 2018. ^ Neubert, Torsten (2 February 2015). "ASIM: Climate and giant lightning discharges to be studied from the International Space Station". DTU Space. Archived from the original on 24 October 2015. ^ a b "ASIM Payload". ASIM.dk. Retrieved 7 April 2018. ^ "B.USOC role in the ASIM operations on the ISS". Belgian User Support and Operations Centre. 30 June 2014. Retrieved 7 April 2018. This page was last edited on 21 July 2018, at 13:04 (UTC).